*A range of writing styles to expose students to a variety of writing genres, maximizing their understanding and appreciation of the written. *Beautiful artwork and photographs to reflect and illustrate the texts, bringing to life adventure stories, poems, practical activities and nonfiction texts. 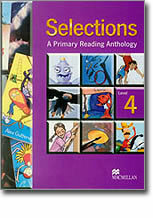 *An audio CD to enhance the students’ experience and readers. *A teacher’s Edition to highlight reading strategies and guide students toward effective reading skills, giving them a head start on the path to becoming enthusiastic independent and lifelong readers. * Extra photocopiable materials in the teacher’s Edition to extend the topics covered.